As part of the RBD challenge, the Making Bay studio helped advance the design research of the Public Sediment Team. 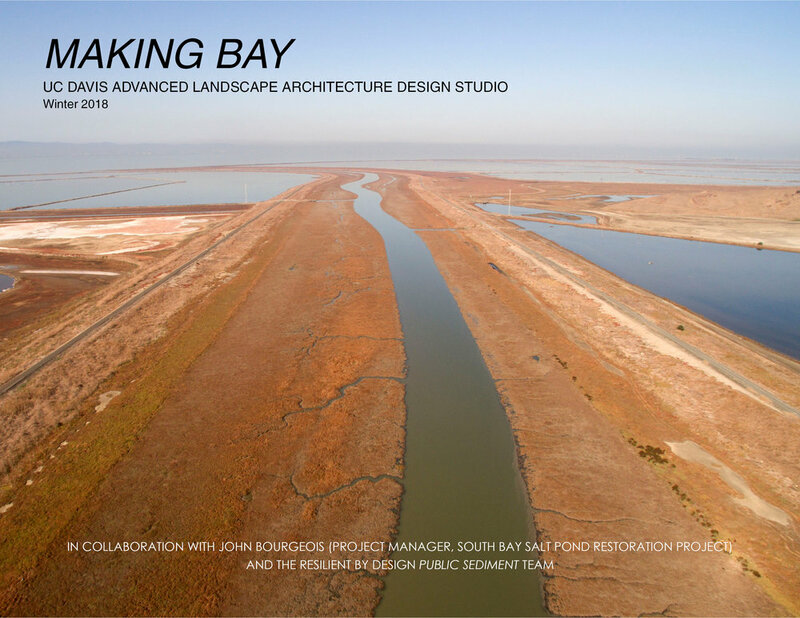 Timing wise, the studio occurred at the beginning of phase two of the design competition and jump-started design exploration at the intersection of the Bay and Alameda Creek and Lower Alameda Creek (a focus area of the larger Alameda Creek watershed that the Public Sediment team was exploring). The work of the studio explored new options within the current Eden Landing Restoration frameworks and tested the capacity and limits of different detailed design strategies. Student work was used at design workshops with stakeholders and at public meetings, and the mid-term and final design reviews were attended by Public Sediment team members, John Bourgeois Project manager of the South bay salt pond restoration project) and outside experts. The site for the studio was in the South San Francisco Bay, where Alameda Creek and Old Alameda Creek meet the Baylands. Typical of much of the Bay, here both the marshes and the Creeks have been highly modified through past engineering. The creeks were rerouted and channelized for flood management, which severed their connection to Bayland marshes and greatly reduced former floodplain habitat. The vast tidal marshes themselves (locally known as Eden Landing) were converted into solar salt production ponds in the mid 19th century. The condition of this area is poised to radically change again. Regional planning mandates call for widespread restoration of the Bay’s tidal marshes to recover ecological habitat for endangered species, recreational uses and for flood attenuation. The South Bay Salt Pond Restoration Project alone is one of the largest tidal marsh restoration projects in the United States. Similarly, the Bay’s stormwater channels are also being reconsidered based upon observed design limitations since they were constructed. Under initiatives such as “Flood Control 2.0”, efforts are underway to reconnect these channels to the Bay’s tidal marshes for mutual benefit. Students worked in four interrelated groups to focus on the design of specific earthworks and technologies within this landscape. These groups included: choreography of ponds, breaches and channels, land mass, and wetland terrace. This focus group explored processes for how the Lower Eden Landing ponds (formerly used for solar salt production) could be returned to tidal marsh elevation (near mean higher high water -- MHHW -- elevation) to support the restoration of tidal marshes, which is one of the most critical aspects of the project. Students used scenario planning to explore how this could be achieved via proactive and passive means and projecting results fifty years into the future. This group explored how to tidally reconnect Lower Eden Landing to the Bay and to its Creeks through strategic breaching of leveed channels. Reconnecting the channels to the bay facilitates the beneficial deposition of sediments in the marshes, while also creating more estuarine-like habitat and needed connectivity for endangered aquatic species such as steel head. This group explored design an outer barrier, or land mass, to reduce potential wave erosion and to direct and slow tidal inundation at the Bay edge. The land mass concept was originally introduced by the Alameda Flood Control District and is designed to be put in place with planned marsh restoration and levee breaching. In the studio, students investigated this concept in more depth, exploring how the earthwork might perform as a multi-functional wave attenuator and as a diverse set of ecological habitats, ranging from sub-tidal to upland. Students explored a variety of landform and living shoreline concepts to increase ecological value for a range of endangered and targeted species. The differences between the outer exposed slope facing the Bay (more wave energy) and the inner slope facing the restored marshes provided two distinct conditions to design for. Instead of creating one master plan of the forms and character of a land mass, each student worked individually in context to the unifying concept to produce increased exploration and understanding of a living edge at this site. Levees and urban space sit where marshes used to thrive. With sea level rise, much of this coastal development will be under water in the next 100 years; traditional flood control methods will not suffice. Students in this group to critically assess the proposed design of a wetland terrace - commonly knowns as a horizontal levee -- and test the adaptive capacity of this landscape technology to “buy time” while communities adapt to climate change and sea level rise in other creative and more systemic ways.